If you want to get the best out of your iPhone and improve iPhone battery life, we have some handy top tips that will help you maximize your iPhone battery. There are a number of things that can drain the battery life, if your follow our tips you will be able to improve your iPhone battery life and get the best out of your device. The first thing that your should do is check what apps or services are using up most of your battery life on your iPhone, this can be done by going to Settings > Battery, under the Battery Percentage settings you will see ‘Battery Usage’, this provides a list of the apps and features that have been using your battery and will show you a percentage of what each app is using over the last 24 hours and also over the last week. This might seem like an obvious one, but if you are using your iPhone on full brightness then this could use up your battery much quicker than if you ran it on 50 percent brightness. Turning down the brightness to around 50% or even 25% percent could make some significant improvements on your battery life. This can be done by going to Settings > Display & Brightness and then reducing the brightness to what you think will work for you. 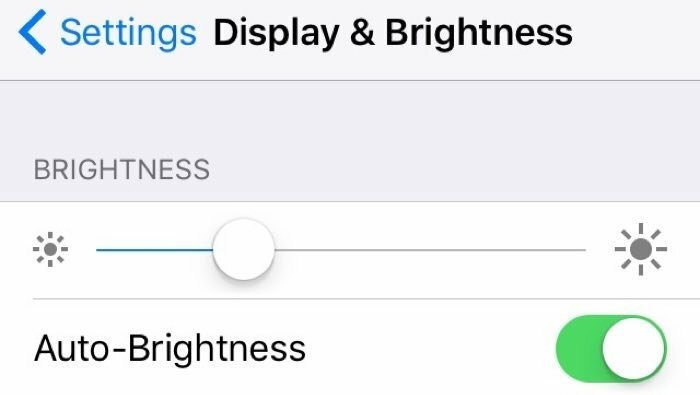 If you find a level of brightness that works for you, then you could turn off the auto brightness feature as this adjusts the handsets brightness based on the lighting around you. One feature in the latest versions of Apple’s iOS that is worth looking at turning off is Background app refresh. This can be done by going to Settings > General > Background App Refresh. 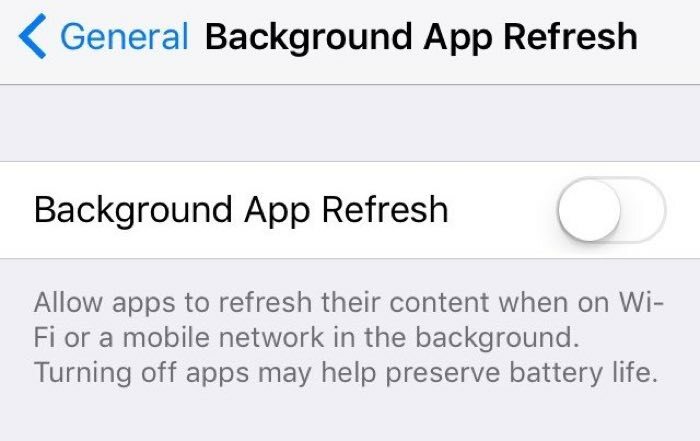 There are two options that you can use here, you can turn the Background App Refresh feature off for each individual app you have installed on your iPhone, or you can turn the feature off completely, so none of the app refresh in the background. The second method of turning off the feature completely so that none of the apps refresh is the one I use and this will help you increase the battery life on your handset to get the most out of your iPhone. 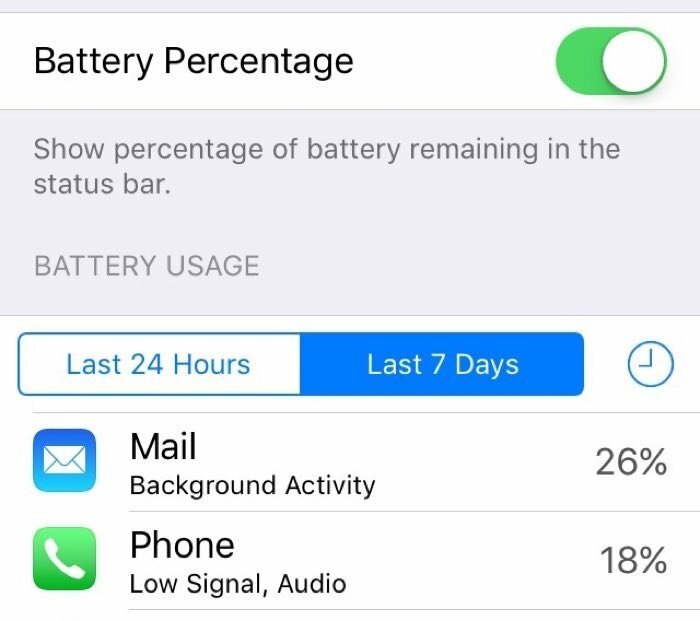 If you are running a lot of apps on your iPhone and have notifications on for all of them, this can significantly use your battery, constant notifications from multiple apps will have a negative effect on your iPhone’s battery, editing which ones send notifications can help improve battery life on your device. I tend to turn off notifications for the majority of the applications I use, the ones I keep on are for things like email, text messagse and generally a few other apps that I want notifications from. 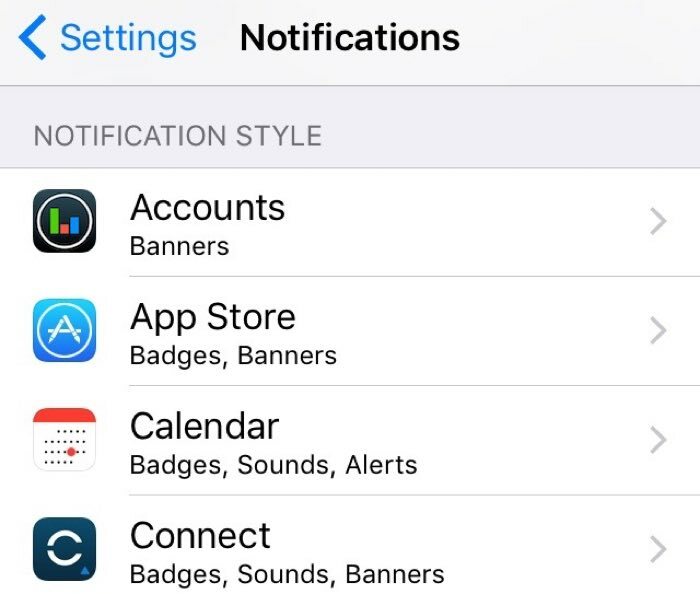 You can choose by each app that you have installed on whether you want to receive notifications from that application, this can be done by going to Settings > Notifications and then choosing the app that you want to change the settings on, this is a great way of saving power on your iPhone and increasing your battery life. 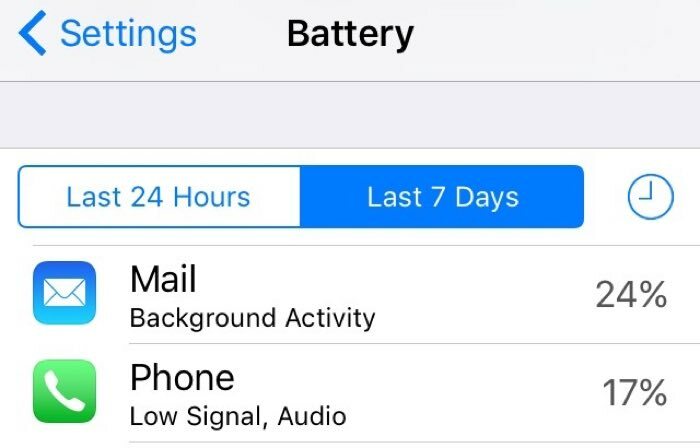 If your email is set to Push and you receive a lot of emails every day then this can use up a lot of your iPhone’s battery life, one way around this is to change from Push email to Fetch email, this allows you to choose an interval where your iPhone will check for new emails. By using the Fetch feature rather than Push, you can choose to let your iPhone retrieve your emails on a regular basis, you can choose to have them fetched every 15 minutes, 30 minutes or hourly. There is also another option, you can choose to Fetch your emails manually, this will happen when you open your email map, then latest emails will then be downloaded to your device when you run the Mail app. 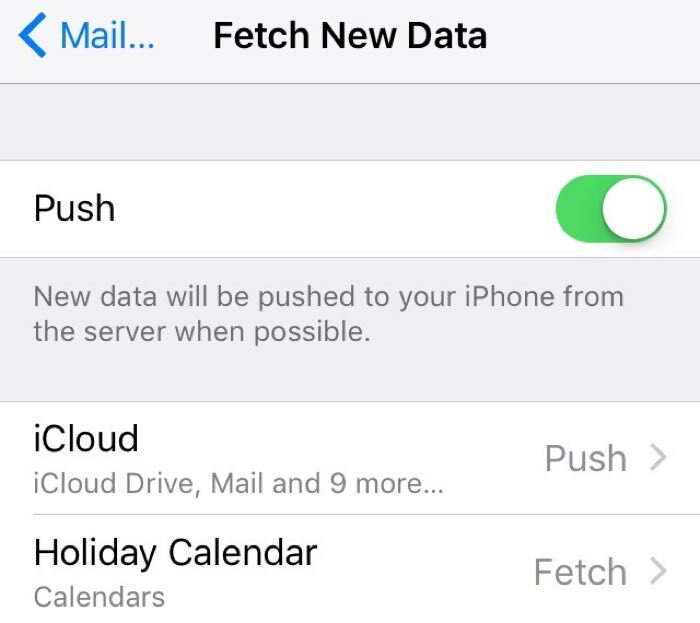 In order to change your email settings from Push to Fetch, you need to go to Settings > Mail, Contact, Calendars > Fetch New Data, you can then choose either Fetch or Push and the time interval you want to use. This is really helpful if you get a lot of emails, even if you set Fetch to get your email every 15 minutes, it should be better than you receiving emails every few minutes. One of the biggest battery drains on the iPhone is not the handset itself but a low or weak signal with your mobile carrier, a poor signal is one of the largest battery drains on the iPhone. If you have a number of apps setup to use your carrier service, then connecting to WiFi whenever possible should help with this problem and stop your handset searching for a signal constantly. Another way to increase the battery life on your iPhone is to turn off automatic downloads when using cellular. This will also save you data on your monthly mobile data plan, as you can set it so that the downloads only happen when you are on WiFi. 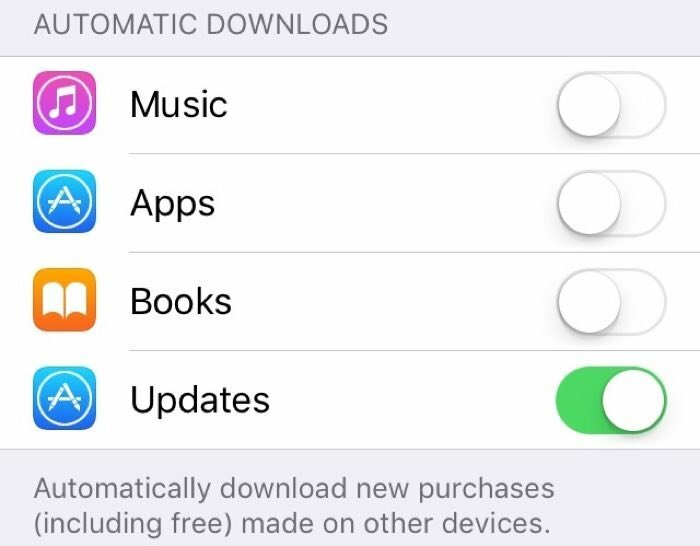 You can choose whether you want to turn off automatic downloads for Music, Apps, Books and also updates for apps, it is possible to select the ones you want or turn them all off by turning off the mobile data feature. This can be done by going to Settings > iTunes & App Store > Use Mobile Data, you can also select individual items including apps, music, updates and books. When you have finished using your iPhone the handset will automatically turn the screen off after a set amount of time, choosing a lower setting for Auto Lock can help improve battery performance. I personally use the lowest setting which is 30 seconds, you can choose between 30 seconds and five minutes or choose never which means that you handset will always be on. With the latest iPhone’s having a fingerprint scanner, it is easy to unlock your device after it auto locks, so choosing a lower setting is not a problem as it is simple to unlock your device. 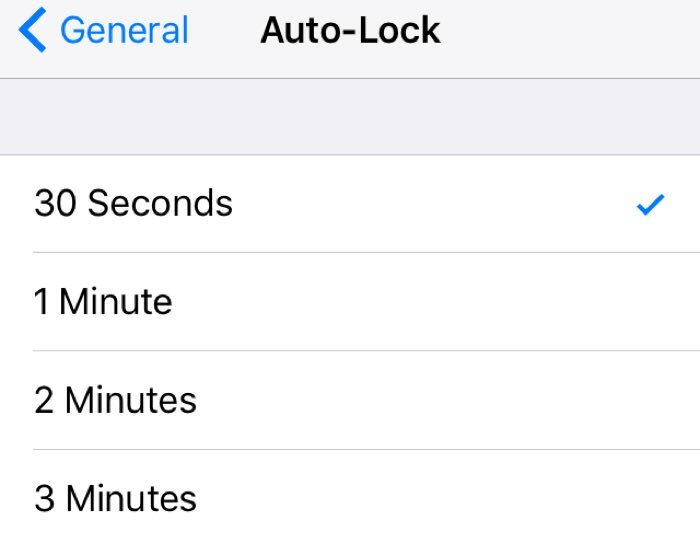 This can be adjusted in the settings menu on your iPhone by going to Settings > General > Auto Lock and choosing which time setting suits you. 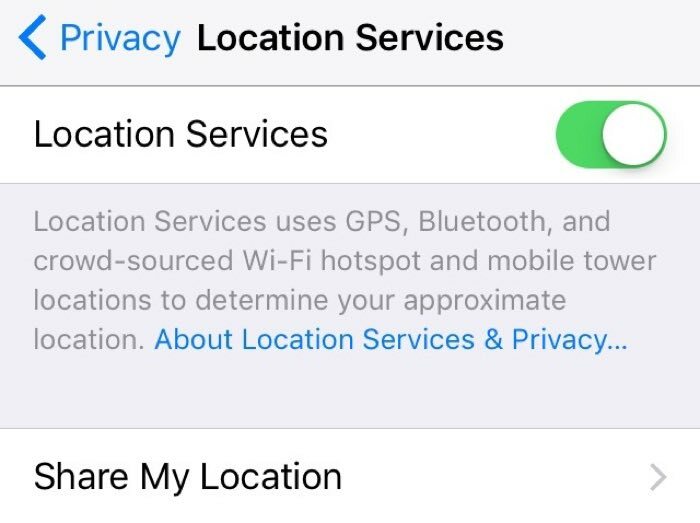 You can turn off location tracking unless you use Apple Maps or Google Maps on a regular basis, this can always be turned back on if you want to use one of those apps, this should help improve the battery life on your handset. 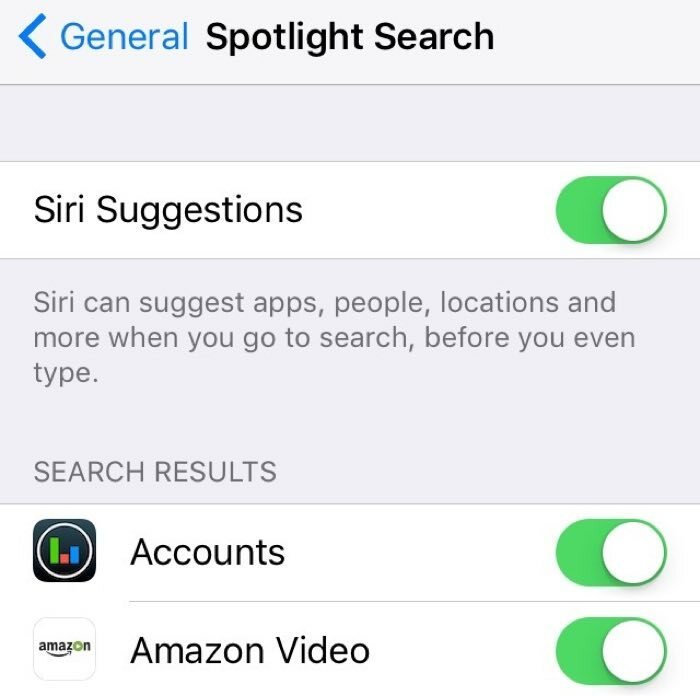 Spotlight Search is designed to search everything on your iPhone, this includes apps, contacts, your photos and more, you can turn off the ones that you don’t need to use the feature with. This can be done by going to Settings > General > Spotlight Search, you can then turn off apps individually. One of the features in iOS 9 is a new Low Power Mode, this can be turned on when your battery is lower than normal. Low Power Mode on the iPhone is designed to optimize battery life and get the most out of the battery power that you have left. 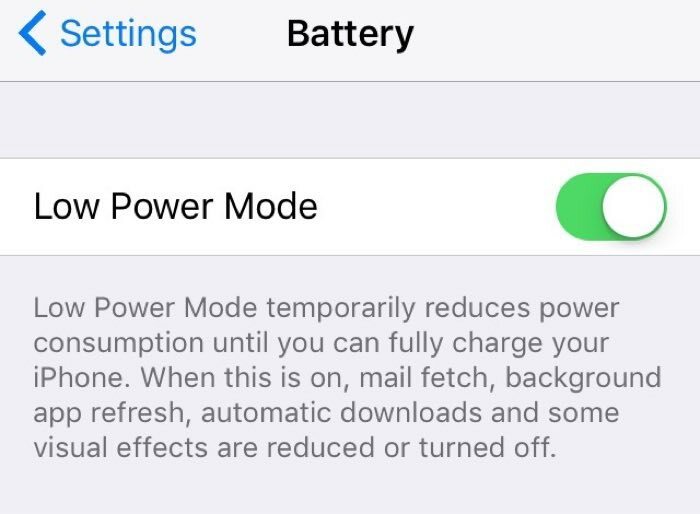 Turning on Low Power Mode on the iPhone will reduce usage of a number of services, including mail fetch, automatic downloads, background app refresh and also some visual effect, this can be really useful when you have a low battery. You can turn on Low Power Mode on your iPhone by going to Settings > Battery > Low Power Mode. Apple’s Craig Federighi recently confirmed that shutting down apps on your iPhone will not improve battery life. Once apps are put into background mode they use no battery power at all, regularly shutting down background applications will actually use more power than if you just leave them open in the background. Many people, myself included have Bluetooth and AirDrop turned on even when we are not using these features, if you turn both of these off when not in use then this will give you additional battery life on your iPhone or iPad. I only use Bluetooth with my hands free kit in the car, so turning this off when I am not in the car has helped increase the battery life of my iPhone. I also rarely use AirDrop, but when I do this can easily be turned back on from the settings menu. These top handy tips should help you improve the battery life on your iPhone, most of them will work on the majority of versions of iOS with some only working on iOS 9 or above. These are designed to help you get the maximum battery life out of your iPhone. You can choose to use all of the tips above or just the ones that think will benefit your battery life the most. 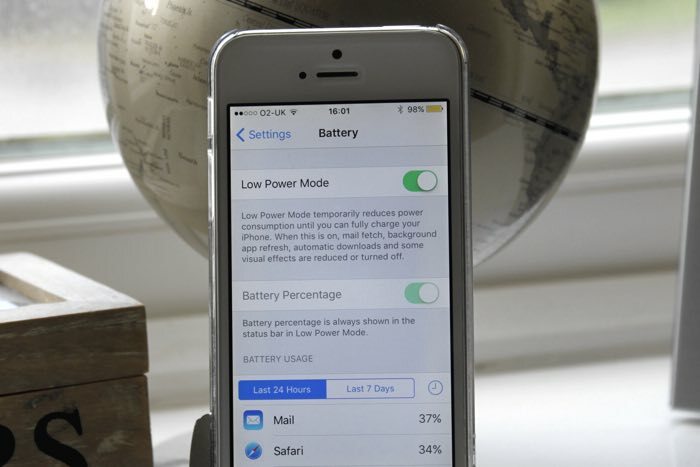 You can find out some more details on how to increase your handsets battery life over at Apple. Updated 18th April 2016 with more iPhone battery saving tips!